Tango and fairy tales mix freely in this seductive, irreverent, and sensual collection of poems. From a city that is at once Buenos Aires and all others, Alicia Borinsky brings to life reluctant mothers, slightly mad teachers, selfless wives, neighborhood witches, best friends, sworn enemies, torturers, vamps, cheats, and lovers—a gallery of characters who wink and boldly gaze back at us. Vignettes become poems and poems become vignettes, reflections that dance, reveal, conceal, enchant, confess, and dream. Frivolous Women invites us to visit the darker and lighter sides of laughter and love and feel the tenderness of recovered memories as we cross the bridges of relationships and stroll down the mysterious streets of childhood. Alicia Borinsky reminds us that the revelations of poetry are always intimate and dangerous. Cola Franzen’s agile and insightful translation, crafted in close collaboration with the poet, is faithful to the letter and spirit of the original Spanish in this bilingual edition. Sera una despedida? / Farewell? 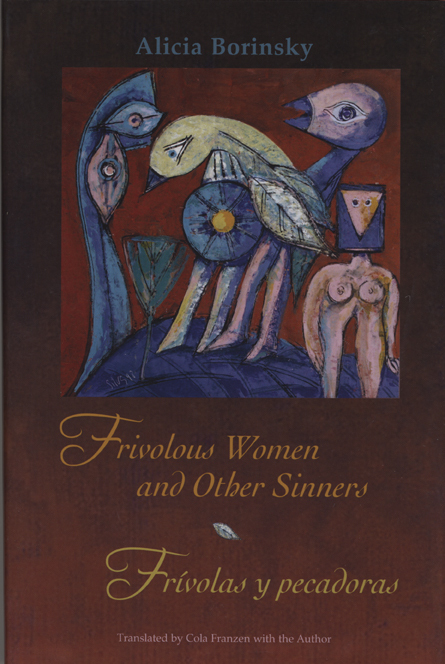 "While the title almost implies a reproach, Frivolous Women and Other Sinners is a celebration of the eccentric, defiant, glamorous cast of characters who inhabit Borinsky’s poetry—women doing their level best to give sin a good name. In many ways, the collection invites comparison to Sappho. . . . Borinsky has both charm and core. . . . The English-language poems retain the bounce of the Spanish originals and are bursting with confidence." "It’s rare to find a poet who is as unabashedly narrative and playful as Borinsky. Add to that her pleasing idiosyncrasies in language and subject, and Borinsky’s new collection is an unusual and worthwhile read."